Getting a cash advance with a credit card is something that more and more consumers do on a regular basis. Some people may not realize that their credit card can actually produce cash at the ATM. While this can be a handy source of funds in an emergency, it is not without its disadvantages or risks. When you make purchases on your credit card, you will have a purchase limit. Therefore, if your limit is $5000, you cannot buy more than $5000 worth of goods or services with the card. However, one thing that many people do not realize is that they have a separate limit for their cash advances. While you might have a $5000 credit limit, you might only be able to get $1000 in cash. 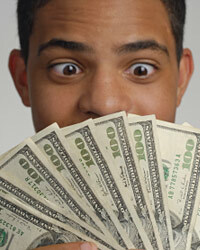 If you are planning on getting cash because you have not yet reached your $5000 limit, you might be in for a surprise. This surprise can often come at an inopportune time as well. Therefore, you should call your credit card company and make sure that you fully understand the limits and how they work. Besides having a separate limit on your cash advances, you will also have a separate interest rate for the cash advances. The interest rate will usually be higher for cash advances than it is for regular purchases. Credit card interest is regularly high enough on its own. Then when you actually get a higher interest rate for cash advances, it can be an unwelcome surprise. While you might pay 20% APR on purchases, it might be 25% for cash advances. Therefore, you should pay close attention to which part of your balance is cash advances and which part is regular purchases. This is a good way to accumulate a large credit card balance if you are not careful. Most of the time cash advances are completed at ATMs. This means that the ATM provider is going to receive a fee for the transaction. While the fee might seem small at the time, they can add up if you take out cash consistently. Although this might seem like an easy fix in case of an emergency, you should not take this lightly. Cash advances come with steep interest and it could take you a long time to pay them back. The more money you borrow from your credit card, the harder it will be to get your financial situation back under control. Many people have had their credit and their financial lives ruined with the help of credit cards. Credit card cash advances are just another way that they can hurt you if you are not careful.